STAINLESS STEEL EXTERIOR: Exterior tubing is made from stainless steel, ensuring quality and longevity. EPDM INNER: Inner pipe made of non-toxic, ordorless EPDM material, high pressure resistance. SOLID BRASS CONNECTOR: Conical and hex connector are both constructed from brass, 1/2" IPS, straight threads. BEAUTIFUL FINISH: Multi-layer chrome finish, build to resist daily corrosion, scatches and tarnishing. 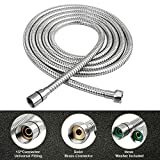 DURABLE ANTI CORROSION REPLACEMENT: The connector with rotatable parts so that the hose will not twine. If leaks, please don't hesitate to contact our customer service.